Well I wouldn't want 2012 again as that caused lots of problems with honeybees dying off and flowers budding at all the wrong times. I just want an average winter for once. Everyone thinks the PDO will go back positive. I'm confused why everyone thinks that when aren't we supposed to be in the long term neg PDO cycle anyway? Everyone thinks the PDO will go back positive. I'm confused why everyone thinks that when aren't we supposed to be in the long term neg +PDO cycle anyway? That was the warm blob winter, and the blob is back. Either way, I don't expect an average winter here. Just about everyone is calling for a very cold eastern US winter. Been this way since 2010 when this trend started. Mild or even average winters are now more rare than the colder winters. Even in the northeast 1964-5 was normal and 1967-8 was brutal, at least through mid-January. In fact even KNYC (Central Park) went below zero a few times. 1971-2 and 2011-12 were torches. 1971-2 cooled down after around January 28, but that was as the super Niño began to evolve and the PDO went neutral. 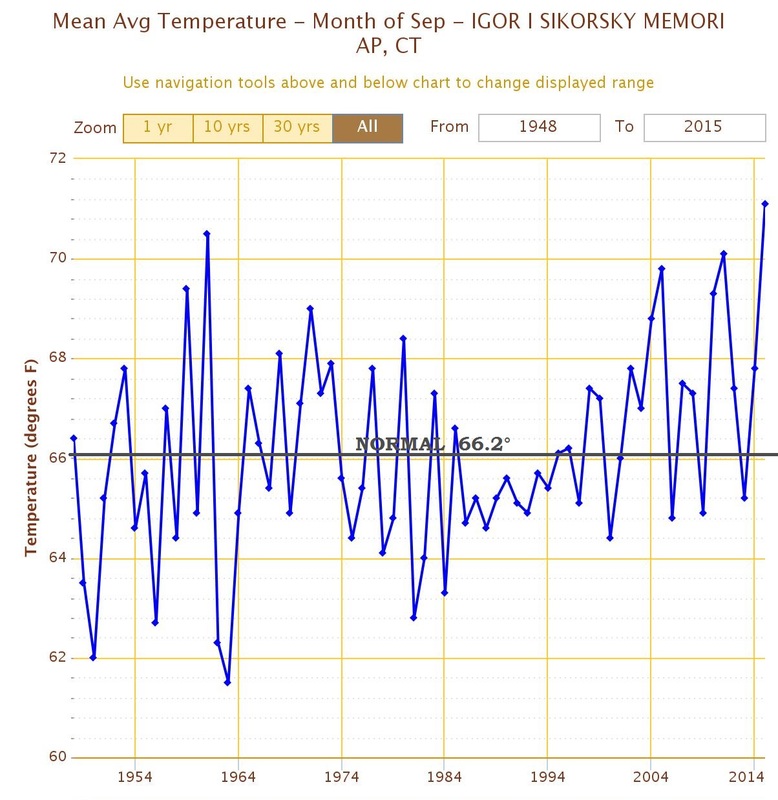 September Average temp since 1948.. Check out 1980s and even into the 90s. Our thoughts are right. Was below normal and more fall like then. Last year was record warm. We only had 5 below normal Septembers since 1990s? Going further and on topic of this thread....... does this surprise you?? Atlantic Ocean temps.... There's part of your reason. The phase of the Atlantic has been warmer. Need it to cool off and usually happens every 2-3 decades or so. Last edited by Cambium; 09-07-2016 at 08:07 AM.. Yes, summers and Sept back then were colder as I showed every year from 1977 to 1989 had an annual mean temp below average. But when does the PDO go back into its supposed current cycle of cold? It has flipped to warm now for 4 years and needs to go back to cold where it belongs at this point in its cycle. I don't see the PDO effecting the trend here that deviates from the long term rise in September temperatures. Last edited by chicagogeorge; 09-07-2016 at 01:12 PM.. Transition month might be hard to see with your location? The graph before was the AMO and Bridgeport would definitely show for good reasons of being near the Atlantic. Someone said to me that they don't think the PDO will go back strong positive this winter because it never does... So I checked... It has.. Transition month might be hard to see with your location? The graph before was the AMO and Bridgeport would definitely show for good reasons of being near the Atlantic.